Ten years of writing commercially went by and one day I felt that I needed to make a shift in my career. 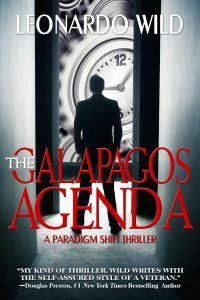 It took me another ten years to figure out how to do it, and then five more before the result—THE GALAPAGOS AGENDA—saw the light of publication. The details of how and why I felt the need to change are not part of this story. Thanks for this Gina. I found the comments on genre very interesting. Scary statics, and I loved the gimps that Leonardo provides into his own writing journey. In writing, shifts and publications happen slowly for me too. It’s comforting to know that I’m not the only one. As long as the shift is happening, things are good. It seems that slow and steady, in the writing progress, really does get us authors, to our destination. I thought they were pretty scary stats as well, Jed. I’ve been looking at people a little differently after reading Leonardo’s post. And as far as writing goes, slow and steady, right? Persistance, enjoying the process and having patience is the key to reaching your writing goals.